Eraser is a feature-rich tool to permanently delete sensitive data from your hard drive by overwriting it with random patterns. Includes a scheduler, free-space wipe, random number generation for better overwriting, page file wipe at shutdown, password-protected settings, and more. The program includes a wide variety of wiping mechanisms from very fast (only deleting the first and last 2kb) to extraordinarily slow (35-pass). Note that all but the most security-minded users should only need only the 1-pass "pseudo-random" wipe. Alternatively, Eraser Portable is a PortableApps version. Note: The 5.x branch is no longer supported. There is a 6.x branch available, but there is no official portable version for this branch and it requires the .NET framework. How to extract: Download the ZIP package and extract to a folder of your choice. Launch Eraser.exe. What's new? Do not erase sparse, compressed or encrypted files when FL2KB erasure is selected to prevent disk corruption. Fix Win32 Eraser builds to be truly Unicode builds. Ensure that Eraser uses the latest runtimes packaged with the installer. This should fix hangs when using the Context menu. Eraser 5.8.8 Portable does not integrate to Windows shell on x64 systems (in my case- Windows 8 x64). Peter: Yeah we've got something in the entry about that. webfork: Yes, the 6.x versions. Peter: you mean the 6.x branch? The latest Eraser version doesn't seem to be portable. Shyssiko: This has been discussed in the forums at length. Once we have our new app directory online, we'll be adding .NET apps but only showing them for users who turn that option on with an appropriate warning about it not being fully portable and only working on XP machines with .NET manually installed on them. Is there a reason, in 2011 that applications requiring .NET framework are still blacklisted from being portable? The majority of computers have .Net installed and Vista/Windows 7 are prepackaged with .Net, so whats the f'ing deal?? (I'm looking at you John T. Haller). Shell integration works fine for me under Windows XP 32 bit with all service packs and patches. I have never had any problems with Eraser, and yes, it deletes the files just fine and over-writes them with 'garbage', depending what over-write method you choose. DOES the shell integration work under xp sp3 32bit? Eraser Portable is now up to v5.87. However, it may not be portable any longer. If you change the erasing method, it leaves a Eraser.ini file in C:\Windows. 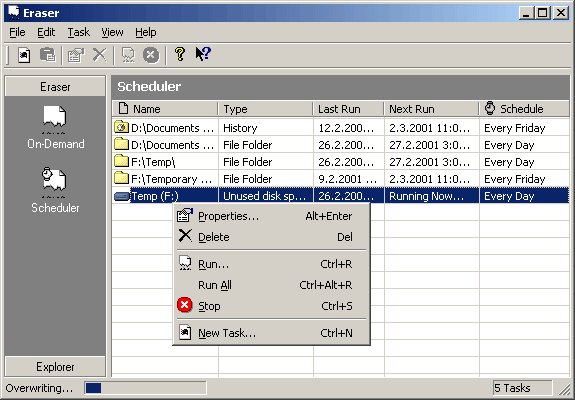 If you delete this, or move to another PC, Eraser resets to the default erasing method. "Wassup: I DON'T recommend using this, it screwed up my system! I tried it just to erase the empty space on my drive and when it was done, I rebooted and the computer went in an endless reboot cycle. I couldn't even get into Safe Mode (all of the Safe Mode rebooted my machine also). Luckily I keep a Windows boot/repair disk handy!" learn how to use it first. I DON'T recommend using this, it screwed up my system! I tried it just to erase the empty space on my drive and when it was done, I rebooted and the computer went in an endless reboot cycle. I couldn't even get into Safe Mode (all of the Safe Mode rebooted my machine also). Luckily I keep a Windows boot/repair disk handy! How efficiant is this? This seems to be the only portable open source file shredder here, so will it delete the files for sure? they replaced the orginal (non portable) version with this one. but didnt migrate the comments. Why is this site deleting any negative comments about all product? This had all the bad issues about data corruption listed. Now they are all gone. What is portablefreeware up to?